Progress Lighting Fresnel Lens Collection 1-Light pendant fixture in brushed nickel finish, features steel construction. The clear Fresnel glass lens creates soft light to the surrounding. This traditional/classic style fixture uses one 9-Watt 90 CRI 623-Lumens 3000K LED lamp that has voltage rating of 120-Volts. It measures 6-1/4-Inch Dia x 6-1/4-Inch. This ceiling mountable fixture has operating temperature rating of 30 deg C. It comes with six links of chain and mounting strap for outlet box. This fixture is ideal for kitchen lighting and/or bar lighting. 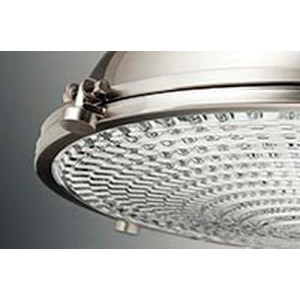 Fixture is cCSAus certified and Energy Star qualified.